Watch a group of young schoolgirls being forced into a terrifying situation at a bootcamp. Remember the good ol’ days of Fear Factor? The reality TV show where contestants would face their biggest fears lying in a coffin filled with rats, swimming through a tank full of electric eels or eating the most gut-wrenching food? A bootcamp may have replicated an equally terrifying situation all in the name of 'motivation' towards a group of schoolgirls, primary school students to be exact. 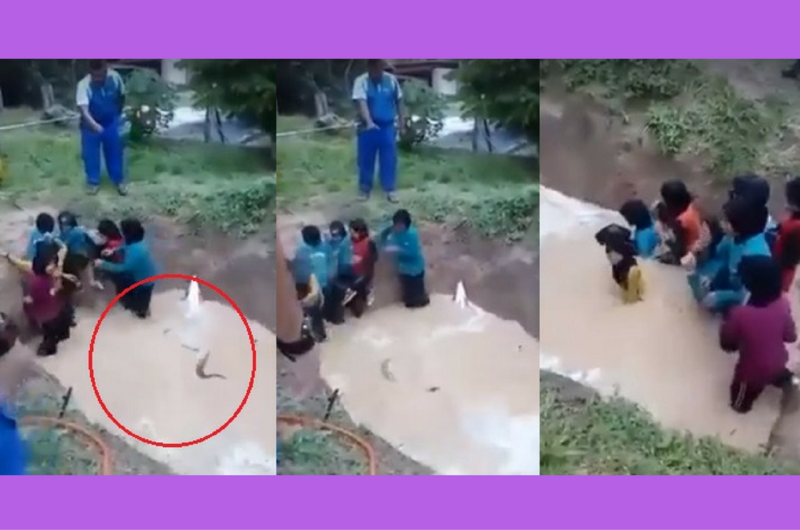 Recently, a video was seen circulating around social media showing a group of young girls being forced to walk through a muddy pit filled with snakes. In the video, a man who appears to be the camp facilitator was heard shouting “Don’t waste my time”, “Be brave”, “Dive” at the girls who were obviously petrified while they make their way through the pit. Onlookers can also be heard laughing and muttering baseless remarks as they watch the girls scream in terror. As the girls reach the other end of the pit, the man proceeded to spray the girls with a water hose and throw more snakes at them while they struggled to climb out. This video has outraged many people since it made its rounds, including the Parent Action Group for Education (PAGE). “How can these people throw snakes into the pond and then expect the kids to be brave and climb out of it? This is child abuse,” PAGE Chairman Noor Azimah Rahim told Free Malaysia Today. “The parents should also confront the principals for endangering the children’s lives. How can they throw the snakes into the pond? This is a primary school, not a National Service stint,” she added. Despite the nature of these bootcamps organised to build character, courage and confidence, stimulating fear and danger among young children like this can lead to trauma and emotional scars. According to several reports, it is believed that the camp was organised by the Malaysian Civil Defence Force (APM). Perak Civil Defence Colonel Mohd Noor Hassan Ashari Sulaiman said that this was the first time snakes were used for a bootcamp in the past three years. “APM places great emphasis on the safety of participants and we are disappointed that such an incident happened,” he said. APM has since suspended all bootcamps for students to investigate whether this particular camp had violated the standard operating procedures (SOP), reported Free Malaysia Today. Whether or not the intention was clear, we hope that the authorities would get to the bottom of this. This Book Aims To Educate Malaysians About Malaysia - Using Just Numbers!